When I was a little girl, I'd arrive at my great-grandmother's house and immediately dart to her living room. Lined with built-in bookshelves filled to the brim with beautiful books (like the second edition Emily Post book that now rests in my office!) and gallery walls of family photos, the room was magical. But it's best feature? 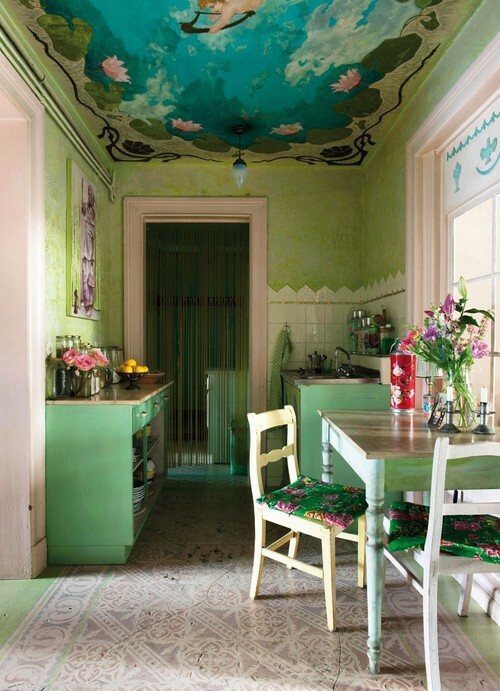 The room was painted mint green. The walls, the trim, the paneling, the built-ins, all of it. A beautiful, glossy, wonderful mint green. And since then, this color has stuck with me. Especially in interiors, my passion. One of my favorite ways to see it paired is with a pop of fresh pink. (Yes, I'm ridiculously head over heels in love with this kitchen. It's official: I need some mint green in my life, stat! Do you love the freshness of mint green as much as I do? 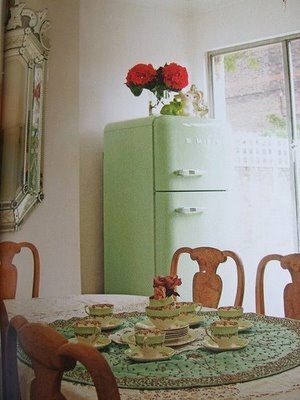 That mint green fridge is probably the cutest thing I've ever seen. soo agree. that color combo is so so lovely RB. Swoon - Love everything! What a great color!!! I have to be honest I was never a huge mi t green person til I saw these pics, now I am loving. Def like the idea of it paired w pink. 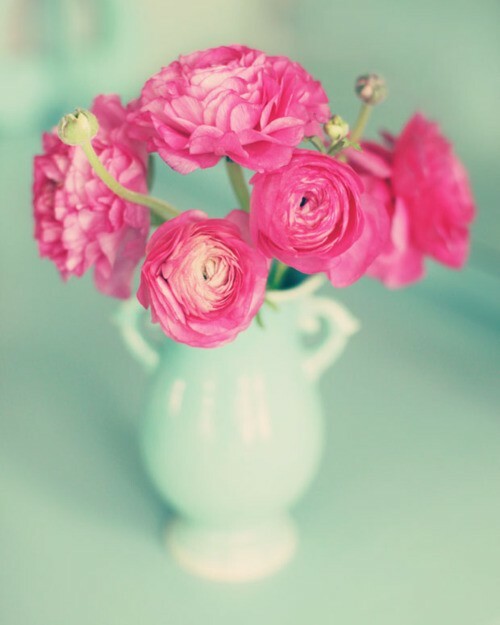 mint green is perfect, but even better with all the pretty pink you have paired it with. that pink scalloped wall paper is kicking. great post! I didn't know I loved mint green, but um, yes, I think I do! These photos are gorgeous!! Wow, the mint green kitchen with the bright pink accents is so pretty!! 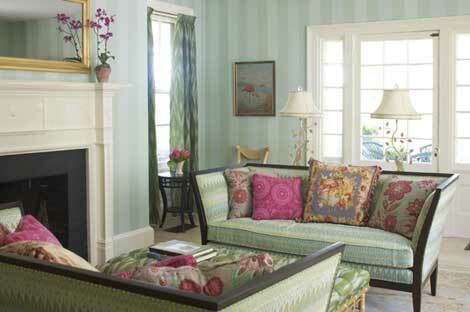 Love that color combination and we are thinking about using it in our powder room - I just love the floral prints! Thanks for sharing this is truly inspiration for me to get started on our painting project! Such a cool and refreshing color. Love it paired with pink. i have always loved mint... it's borderline aqua and so pretty!!! So fresh and pur-tay. Wanna hang out next week? My bedroom is mint green and red - sounds weird but I love it!! It is so relaxing. 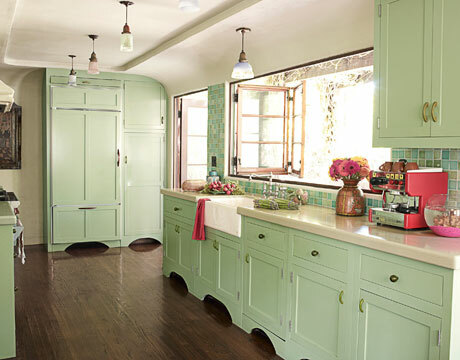 Gosh, I just LOVE that mint green kitchen! To.die.for!!! Such a pretty color. Mint green gives me all kinds of great feelings!! 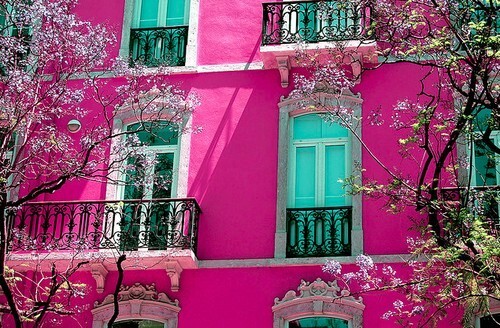 and that hot pink building with mint green doors is ecstatic to say the least!!! I've never been much of a mint green person (or really any pastel colors) but I love that kids room with the pink wallpaper and the mint armoire... perfect combo. It looks so great with pops of pink! Believe it or not my grandmother had a mint green kitchen AND a mint green Cadillac to boot. Big pimpin'. :) Love the color! I've been having a mint green love-fest myself, lately. I love it with the pink, but mostly with whites and blues. Have you noticed it is almost always is paired with fushia or hot pink? Love it! Gorgeous! 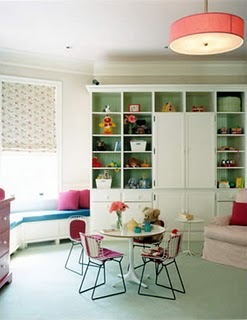 These colors seem so perfect for a little girl's room! Fabulous photos! Love these images for this color combination. This color sticks out more than any other from my childhood. My mom and dad both worked hard and long hours and my grandma and grandpa lived next door...grandma was a housewife and papa was a farmer, so I spent most of my days there. Their farmhouse had this color through most of it. It is now over 160 years old. My grandma (now 95) still lives there and does most things for herself. Everytime I see this color it takes me back to those days.